I spotted this bird in our garden from the ground floor study - this is somewhat rarer than the brown-all-over common-or-garden thrush. The grey head and speckled belly struck me as unusual. 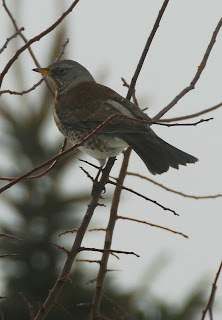 Thanks to reader Mis for identifying the bird as a kwiczoł - fieldfare - which according to Wikipedia is a migratory bird that normally winters in the south. And a propos of our garden, two molehills appeared overnight, great brown heaps of soil on the virgin snow. This being midwinter, I'm not going to be reeling out the hose to flush the vermin out. I hope there'll not be too much more mole activity before the spring (!). UPDATE: 16 January and there are now five molehills on the back lawn.